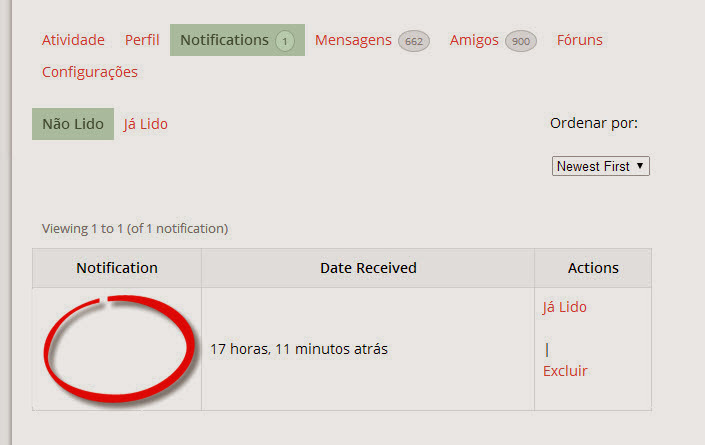 Ever since I upgraded to Buddypress 1.9.1, the notifications function hasn’t been working correctly. As of today, my user notification page contains 43 “blank” notifications. That usually happens when someone deletes the item you’re being notified about. There’s a ticket open to have the notification deleted when the item is deleted but it hasn’t been implemented yet. Unfortunately, I think my issue is more problematic than that…I currently have 43 “blank” notifications and the number keeps growing. I have been receiving these blank notifications ever since I upgraded to Buddypress 1.9.1. I even tried reverting to Buddypress 1.8.1, but this did not resolve the problem. one other thing I forgot to mention; I seem to be receiving normal notifications for friend requests and confirmation of friend acceptance. I believe the majority (if not all) of the “blank” notifications are notifications for messages sent to me by my friends. Have you looked in the db to verify they weren’t deletes? Do you have any plugins installed that might effect that? I remember testing a private activity once that sent notifications even though someone didnt have access to them. I’m curious to know what you find. Good luck. Any thoughts about what might be causing this or how to correct the issue? Looks like 3 of them are from the same topic (15959). Go into the db and do a search on the activity table for secondary_item_id = 15959. That will give you a link to the topic. Go to it and 1: see if it exists still (probably does) and 2: see if there is something weird about it. OH. Is bbpress up to date? Maybe there is a bbpress plugin causing issues? I just tested this on my site. I created a topic as one user. I logged in as another and replied to the top. Notification was sent… no problem. I logged in as administrator and deleted the topic completely. The notification title still showed up, so I doubt deletions are your issue. I tried to revert to buddyPress 1.8.1 and bbPress 2.5.2, but unfortunately this didn’t resolve the issue. Any thoughts about what I should try next? bp_notifications_add_notification was introduced in bp 1.9, so you’ll need at least that version. The fatal error is no longer generated in bbPress 2.5.1, so it looks like something new was introduced in bbPress 2.5.2. Currently on my staging site I am running bbPress 2.5.1 and buddyPress 1.9.2, but unfortunately even though errors aren’t being generated anymore with this configuration, not all notifications are being displayed either. It looks like friend request notifications are working correctly, but user-to-user message notifications are not working. In addition, I am still getting “blank” notifications from the forum (even though I’m not seeing any fatal errors). Any thoughts about next steps? If you can reproduce the blank condition every time when replying to forum topics, then I would focus on that for the time being. (The idea is to find something the fails EVERY TIME so you can troubleshoot it.) Start disabling plugins and revert back to a basic theme. If it’s stops happening, start re-enabling plugins one by one. That’s what I would do anyway. The topic ‘Notification still not being displayed’ is closed to new replies.